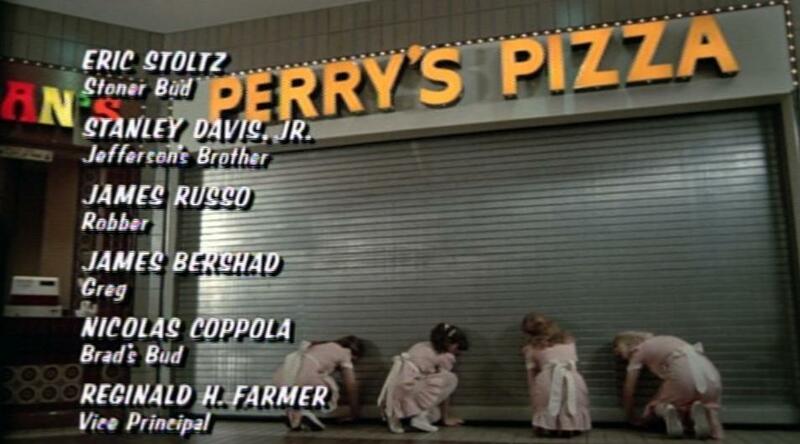 Fast Times at Ridgemont High (1982) – A tale of three screencaps. Fast Times at Ridgemont High was Nicolas “Cage” Coppola’s first movie role, in a film filled with the first appearances of several well lauded Hollywood actors, including old craggle-face himself, Sean Penn, in a role diametrically opposite the ones he has cultivated in every film since. The film itself follows the life and times of several teenagers who go to high school, work in the mall and fail to make any jokes out of the fact that they have a teacher called Mr Hand. Cage himself plays a mysterious character only referred to in the credits as ‘Brad’s bud’ despite the fact that they had no interaction whatsoever within the film. What’s the story here? We at Cage Wisdom leave no stone unturned when examining the underbelly of Cage and so to probe further we shall analyse the three shots which represent (and literally compose) Cage’s role in the film. Yet Brad does explode and soon, in a shot where he is framed standing in front of his own employee of the month certificate, is fired. Cage however does not intervene and offers no shoulder to cry on. No words of advice. In fact, we do not see ‘Brad’s bud’ again for another half an hour. This is not just acting, this is Nicolas Cage acting. If the man who was not famous were in this shot, he would just make the same expression as before. This is not good enough for Nicolas Cage. 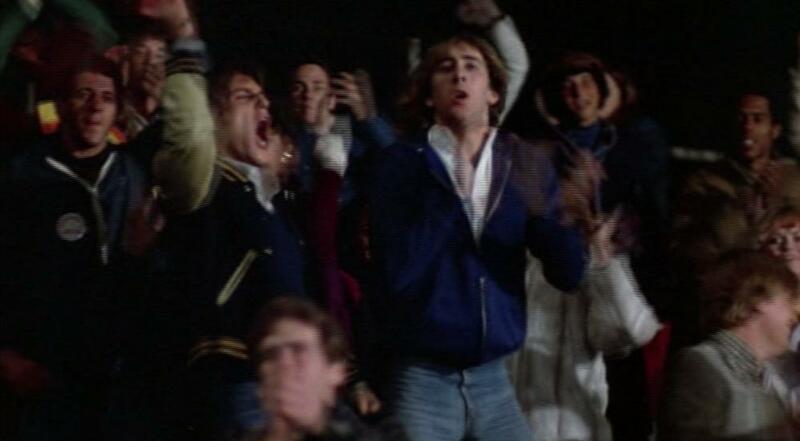 He’s on his feet, clapping his hands in spirited appreciation of Ridgemont High’s football success. Here we’re given a glimpse of what Brad’s bud is like when he’s able to hang loose. He’s obviously seriously engaged in the game, but this being an 80s high school drama, we might expect some adherence to a jock archetype that is clearly not present here. With his slim physique and floppy hair, he looks as if he might write for the school newspaper, hang out with the drama club and kick back with a Simon and Garfunkel album in his spare time. Even at this early stage of his career, Cage defies expectation. More importantly, he is not sat with Brad. Could Brad’s altercation have been the final nail in the coffin for an already shaky friendship? We don’t see Cage again for the rest of the film. He seems to opt out of the graduation ball, perhaps choosing to read a book at home, or perhaps unable to reschedule a shift at work. Perhaps he is just too disgusted with Brad to imagine seeing his face again. If you look closely at the above screen grab you can see Cage’s credit second from bottom, but listed with his birth name ‘Nicolas Coppola’, not ‘Nicolas Cage’ to which he changed his name, so as not to rely upon his famous family’s Hollywood prestige. This would be the first and last movie in which he was billed as Coppola and consequently, Fast Times at Ridgemont High can legitimately be called a turning point in Nicolas Cage’s career.